It is exactly something that the BJP had a sense of foreboding about. The alliance between the SP & BSP in UP is a monumental leap of faith between two sworn rivals. There is every possibility that this alliance may now extend to other states as well. Predicated on playing the caste calculus right, the first such experiment was in Bihar during the 2015 assembly poll. Now in UP as in Bihar, the two parties don't even have minimum representation either in the assembly or in the LS so it was vital for their political sustenance and survival. The joint vote share of these two parties was 41.80 which is even lower than that of the BJP in the 2014 LS poll. The consolidation of the Hindu vote twice in the LS and assembly polls behind Modi has left a political void in terms of bipolarity. The politics of polarisation will meet the politics of appeasement head on now. It is clear as daylight that a united opposition will be the best bet to stop Modi and the BJP in UP. Whether the Congress wants to ally with SP-BSP remains in the realm of conjecture, but given the communal cleave developing in the state with cow vigilantism and other Hindu nationalism theatrics, it would be advisable for a joint collaborative effort to stop a rampant BJP. Bypoll results of Gorakhpur, Kairana and Phulpur showed what a combined opposition can do and this extended to Noorpur assembly constituency where again the BJP lost. The social and caste engineering of the SP and BSP and perhaps Congress if it joins in has to be skewed towards breaking the Hindu vote which has twice aggregated behind Modi. Backwards have been unhappy because Keshav Maurya was overlooked for UP state CMship where Yogi Adityanath got the nod. Mayawati had mastered the social universe and that is how she came to power in 2007. By bringing their innate experience and expertise in realpolitik, both Bua and Bhatija will offer the BJP more than a fight in what will most undoubtedly become a communal cauldron as we get closer to the poll dates. Not only does the construct of the alliance have negatives for the BJP but some positives also accrue. Now that the alliance has been stitched, the political atmosphere will change completely and the buzz will remain among voters about the newly forged alliance besides the winning possibilities. The biggest strength of the alliance is that it will bring the Dalit-Muslim-Yadav axis to the fore in the state. At its very kernel is this math. Obviously keeping a communal BJP at bay is a given. This alliance will now enlarge the scope of the anti incumbency vote against BJP and Modi, which is actually a double incumbency of sorts since BJP won in 2014 and then again in 2017 assembly polls. With the BJP unfurling the Hindu chauvinistic flag on Friday and articulating that they expect the Hindu vote to aggregate behind Hindu Hriday Samrat Narendra Modi, the path to Delhi will be via the Saryu River. The conjoined issues of Hindu machismo and Ram Mandir will be the BJP’s clear cut strategy in UP. SP and BSP came together in the 1993 assembly poll in the aftermath of December 1992 Ayodhya issue. Then between these two parties the SP contested 256 seats while the BSP sought the mandate on 164 Seats. The SP won 109 seats while the BSP registered a win on 67 seats. In that election the alliance of these two parties won 176 seats while the BJP also won 177 seats. The Congress brought up the rear with 28 seats. The BJP may also recall the 1993 political scenario to the voters for political benefit. At that time the SP was a new party struggling to completely capture the space of the Janata Dal through the instrumentality of the newly formed Samajwadi party under the leadership of Mulayam Singh Yadav. The non-inclusion of the Congress in the alliance may pose some kind of challenge for the BJP. The INC has a traditional 20-25,000 voters across all the LS seats mainly from the forward and Muslim communities. These are traditional voters who are voting for the Congress party since generations. In case the Congress goes solo, then the voters may vote for the INC which would cost the BJP dearly. During the 2017 assembly poll such voters voted for the BJP as the INC was the ally of the SP. The anti-incumbency of the SP added to the woes of the INC traditional voters. If the INC had forged an alliance with the BSP in the 2017 assembly poll then perhaps the result may well have been different at least in terms of seats tally. In another manoeuvre Apna Dal Krishna Patel faction has joined hands with AAP in UP and in certain segments, it will cut into the vote. The role of the INC will also be crucial not in terms of winning but in putting up candidates. In 2009 LS poll in Bihar the then INC allies RJD & LJP forged an alliance and voluntarily gave 3 seats to the INC by dividing 25 and 12 seats respectively. The INC put up candidates particularly rebels from these two parties on most of the seats and the INC performance cost the RJD-LJP alliance dearly. As per estimates, it cost the RJD-LJP alliance 20 LS seats in Bihar in 2009 due to INC candidates. The NDA (BJP-JDU) was the default winner, courtesy the INC candidates in Bihar in 2009. The victory of the then NDA in Bihar was much beyond its expectation and in the prevailing political circumstances. The INC can try to emulate the 2009 experience in UP in 2019 if they feel they have not been accommodated respectfully. In 2009, the Congress surprisingly bagged 21 seats and it was believed that this would pave the way for Rahul Gandhi’s coronation, but that didn’t happen. 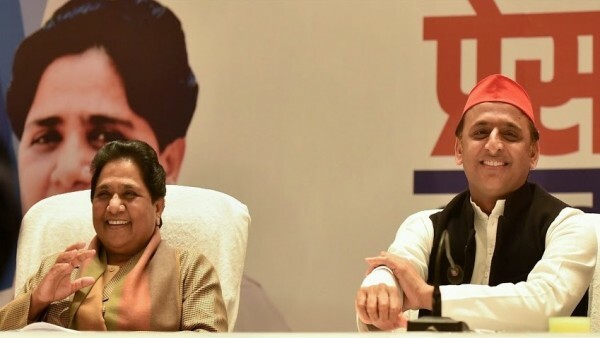 If the Congress stays away from the SP-BSP alliance, it would be foolhardy, but in the eventuality it goes alone, it would try and replicate its sterling show of 2009. The INC will put forward that performance to checkmate the SP-BSP to solicit more seats. Equally, the INC performance of 2017 cannot be considered solely as there is change in voting pattern for LS & assembly polls. As far as RLD is concerned its performance was highly painful in 2014. Ajit Singh was the poor third on his traditional Baghpat LS seat behind the BJP and the SP. Even on Ajit Singh and Jayant Chaudhary’s LS Seats of Baghpat and Mathura, the RLD was unable to establish a lead on any of the assembly seats. The party’s performance was abysmally poor. By contesting eight LS seats, the party garnered only 689,409 votes and managed to save its deposit on only two seats of Baghpat and Mathura. Like the first families of the INC and the SP, only the family of the RLD was able to perform well (save its deposit in case of the RLD first family). The first families of these two parties won on their seats while the RLD first family saved its deposit on their seats. On RLD’s Jayant Chaudhary Mathura seat, there were two Hema Malinis, one from the BJP while the other was an Independent. The Independent Hema Malini actually got 10,158 votes. If we analyse the assembly segment-wise performance of the Baghpat LS seat then in Siwalkhas, the RLD was on third spot much behind the BJP & SP, while in Baghpat, the RLD was in the third spot, much behind the BJP & SP and in Modinagar, the RLD was on 4th spot behind the BJP, SP & the BSP. On Baghpat LS Seat Satyapal Singh was the BJP candidate, Ghulam Mohammed was the SP & Prashant Chaudhari was the BSP candidate. So the RLD performance was poor even in Ajit Singh’s traditional seat of Baghpat. So the stakes of the RLD in the forthcoming LS poll are limited despite Ajit Singh’s bravado. However for Sp and BSP, this is a lit must test and for the rejuvenated Rahul Gandhi equally an attritional war.